It was a slow game with not a lot of action, but the Rangers (30-16-1) picked up a shutout overtime win on the road against the Detroit Red Wings thanks to another game winning goal from JT Miller and a strong effort from Henrik Lundqvist. The teams combined for a total of 40 shots through almost 62 minutes of play, but neither team was able to keep up sustained pressure for large portions of the game. The Red Wings had their best chances in the first period, but Thomas Vanek hit the post and Henrik Lundqvist made a nice glove save on Anthony Mantha. The other prime opportunity for Detroit came in the third period, where Henrik Zetterberg hit Lundqvist’s mask with his shot in the slot. The Rangers (7-3-0) continued their three game homestand against the Blues, and surprisingly cruised past the St. Louis Blues (5-3-2), seeing their offense explode for another five goals in a shutout victory. Henrik Lundqvist recorded his first shutout of the season and the 60th of his career, stopping 35 shots in the process. Dan Girardi opened up the scoring with his second goal of the year, and that was followed by goals from Jimmy Vesey, Rick Nash, Mats Zuccarello and Kevin Hayes. Since these recaps are getting super long due to the Rangers scoring a ton, I’m going to recap all of the goals first, then head into opinions and observations. As the Rangers prepare to embark on their quest for the teams elusive fifth Stanley Cup, their one constant over the past 10 years in Henrik Lundqvist is once again at peak form. On a night following a 1-0 shutout win against the Detroit Red Wings, Lundqvist put what the final minutes of a 0-0 game feel like from his perspective. “The last 10 minutes of the game you definitely know the next goal wins… I know I need to be perfect.” It’s a situation the Rangers veteran net minder has become more than comfortable with over the years as a Ranger. Lundqvist has played in more big games and high pressure situations, in the last three seasons especially, than most goalies do in their entire careers. 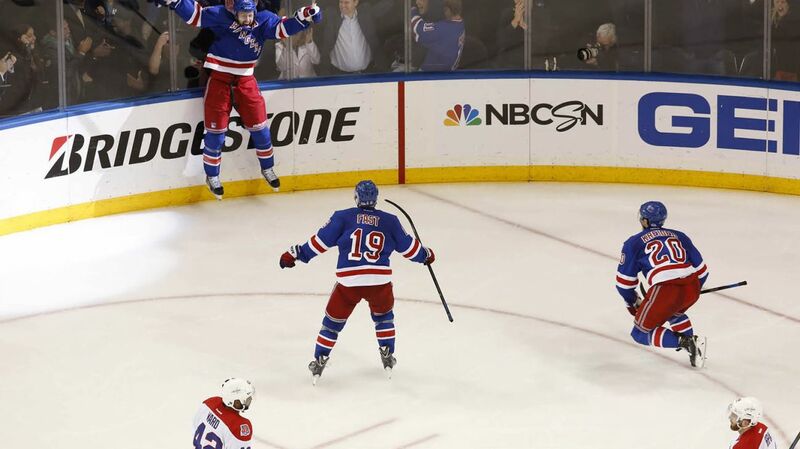 The top five moments of the Rangers season are here. Photo courtesy of MSG Photos. It’s time for the top 5 moments of the Rangers’ season! This contains some of the most action packed games, amazing comebacks, overtime winners and NHL firsts. What do you think of the list? Is there a game or a moment that you think should be on the list? Let me know in the comments section, on Twitter (@The_RangerZone), or on The Ranger Zone Facebook page.